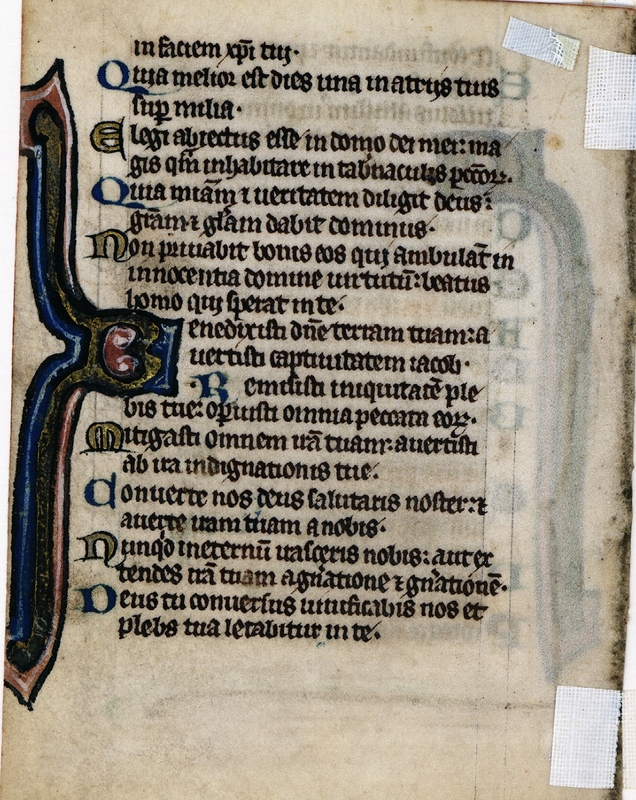 Text: Psalms 82:18-83:10 (recto) and 83:10-84:7 (verso). Reconstruction Note! In Ege's original manuscript, this leaf followed what is now Leaf 12 in the Case Western Reserve portfolio. Together the leaves provide the text of Psalms 81:3-84:7. Et cognóscant quia nomen tibi Dóminus: tu solus Altíssimus in omni terra. Altária tua, Dómine virtútum, rex meus, et Deus meus. 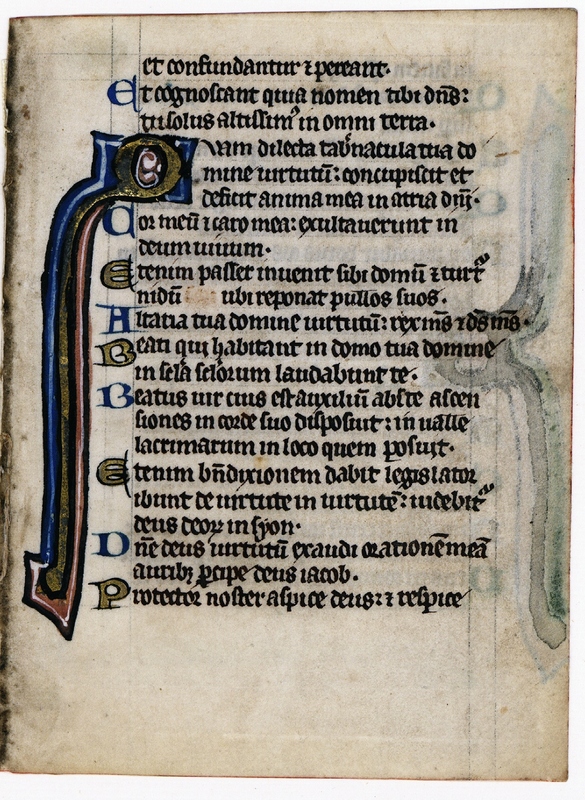 Beáti qui hábitant in domo tua, Dómine; in saecula sæculórum laudábunt te. Beátus vir cujus est auxílium abs te: ascensiónes in corde suo dispósuit, in valle lacrimárum, in loco quem pósuit. Étenim benedictiónem dabit legislátor; ibunt de virtúte in virtútem: vidébitur Deus deórum in Sion. Dómine Deus virtútum, exáudi oratiónem meam; áuribus pércipe, Deus Jacob. Elégi abjéctus esse in domo Dei mei magis quam habitáre in tabernáculis peccatórum. Quia misericórdiam et veritátem díligit Deus: grátiam et glóriam dabit Dóminus. ...on the face of thy Christ. 11 For better is one day in thy courts above thousands. I have chosen to be an abject in the house of my God, rather than to dwell in the tabernacles of sinners. 12 For God loveth mercy and truth: the Lord will give grace and glory. 13 He will not deprive of good things them that walk in innocence: O Lord of hosts, blessed is the man that trusteth in thee. 2 Lord, thou hast blessed thy land: thou hast turned away the captivity of Jacob. 3 Thou hast forgiven the iniquity of thy people: thou hast covered all their sins. 4 Thou hast mitigated all thy anger: thou hast turned away from the wrath of thy indignation. 5 Convert us, O God our saviour: and turn off thy anger from us. 6 Wilt thou be angry with us for ever: or wilt thou extend thy wrath from generation to generation? 7 Thou wilt turn, O God, and bring us to life: and thy people shall rejoice in thee.